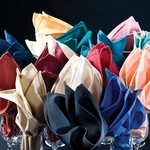 Premier Table Cloths and Napkins are extremely durable and have ColorGuard technology to protect colors from fading when laundered frequently. Even though Premier Spun Poly Table Linens are easy-care and durable, using proper laundry procedures, weather in house or outsourced, will give you the best ROI on your table linens. Premier 100% MJS Spun Polyester table linen will last a minimum of 200 industrial washes when recommended laundering procedures are followed when using commercial machines. Lab formulated commercial laundry recommendations are available below as pdf files to help your housekeeping or laundry service get the most out of your table linens. If you have any questions, call or email us for personal help with your laundry questions.